Here you find all important information about us. Services, examples, references & contact information. We would be happy to advice you in 3D questions and aquire you as our customer. A new series of video tutorials for 3ds Max is availlable at www.psd-tutorials.de. Mike Kuhn, Autodesk Certified Instructor for 3ds Max, explains 3ds Max for beginners and advanced users. Conclusion: 27 Hours of Video Training of 3ds Max for 3D-users and those who want to learn! Take a look at the german product details! » As a German Download version including Cover + Label for print out! There are two very helpful DVDs for all 3D fans and professionals on the market, we would like to offer. 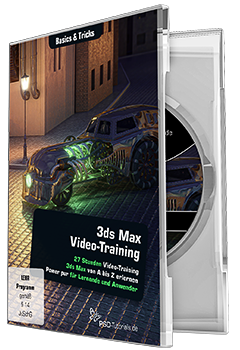 First the 3dsMax basics, a quite complete DVD, not only for newbies, and the 3dsMax Pro workshop for advanced users. You would be best suited with both.